Oquossoc is a small town in western Maine. It sits on the lakes of Mooselookmeguntic, and Rangeley. The town has some small shops, restaurants, a general store and now an outdoor heritage museum. The outlet to Rangeley Lake is there and creates the Rangeley River. The river flows a short distance until it joins the Kennebago River and flows into Mooselookmeguntic Lake. The Rangeley River has been a fishing destination of mine for many years and has given up some beautiful brook trout and salmon. In the fall each ascends the river from Mooselookmeguntic to spawn. To journey along the river will offer wildlife views that are spectacular, moose, black bear, deer, and partridge. I have created this streamer and have named it after this wonderful place in western Maine. Solitude is what I seek out as I fish the wild trout streams. It's not that I'm antisocial or selfish, it's because I enjoy being one on one with all that I encounter in the forests and waters. The pure beauty of being alone, the deafening quiet, that a birds chirp is heard, the fresh smell of the earth, and the sounds of the stream. Go there if have not experienced such tranquility, try it. This is one of my better seasons to enjoy. It is a short season, late September through Thanksgiving, after that almost anything is possible. I created this streamer to celebrate this wonderful season. These are some of my favorites, maybe not the best choices one could make, but they are little comforts that help me enjoy life a bit more. I'm sure a lot of you have your goodies too. These are not your granny's best, but they satisfy, and they are portable. Pumpkin seeds, these are addictive, you'll never eat only a few. At my age, I have consumed coffee from everywhere imaginable, almost every brand, and brewed every way. This is the best. Breakfast comfort, bagels, and wild blueberry jam. French toast, what could be said.. just look. I enjoyed these as a kid, when you could by them in a corner store for a penny each, then go to school. This is a small stream located in southeast Connecticut. 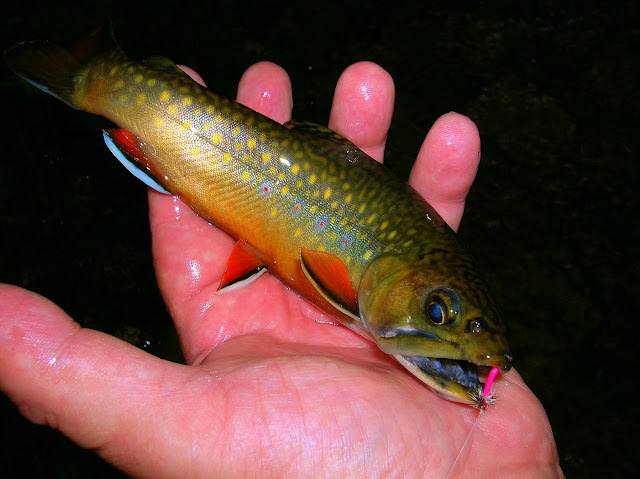 I have fished this stream many times and have taken many of brook trout. Lovely little jewels, wild and spunky. Over this past year or so I've taken a few small brown trout, this does not surprise me for a lot of Connecticut's small wild trout streams have both present. Yesterday while enjoying what ever this late September day offered, I was given a surprise, one that I did not expect. This stream is a classic small stream, 3 to 5 feet with runs, pools, undercuts, and lots of woody debris. 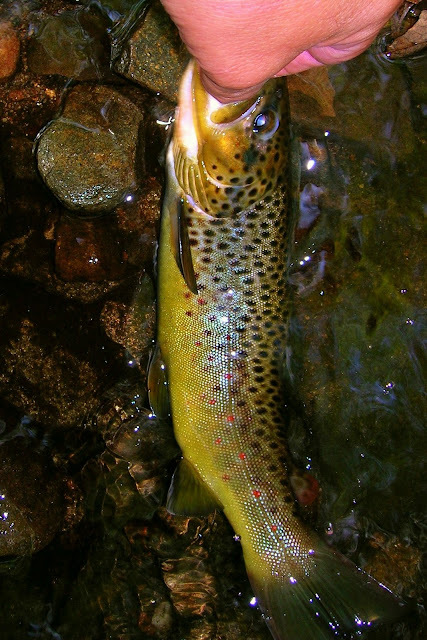 While most of the trout will be found in likely holding areas, this time of year they are on the move and might be anywhere, even right in the middle of the stream. This brookie was taken in the middle of the stream, at that soft spot near the black rock. Bends in the stream are always good places to find trout. This one has the added bonus of some woody debris. Where I find undercuts I will always fish them. This one I was standing above it, and drifting, and bouncing the fly. There was an eruption, and all I felt was weight, then that feeling of the roots or anything else that was under that bank. By keeping pressure on the fish I was able to bring the fish out. He tried to run as much as possible but there was not much there. Finally I was able to gain the upper hand and brought the brown trout in. He was handsome, beautiful spots, dark and red, with a hint of buttery soft yellow. I was afforded a quick photo before he went to his dark lie. Not a giant as brown trout can be..... but he is a monster for this stream. One I placed in my minds journal, and will not forget. One never knows what might swim in a small stream. Litter in it's natural form is pretty common along the woods and streams we frequent. Not much is made of its existence, and is mostly overlooked, for it does no harm. Most of the streams I fish are on public lands, but several pass through private land. I have gained permission to fish these streams through the kindness of the landowner. I respect that land. There is no greater reason for land to be posted than when people dump on private lands. Natural litter can be seen along woodland paths. But this is the way to bring about... NO TRESPASSING. Well my first cup of Green Mountain coffee is starting to kick in, so I maybe able to write some of my thoughts, while actually knowing what I'm saying. Jeanette and I took in a few small farmers type markets Saturday. It was a crisp day, perfect for checking all sorts of local wares. We came out of there with breads, heirloom apples, handmade wine bottle stoppers, and a wonderful appreciation for a two piece band singing 50's and 60's folk music. Along the way I picked up on a lovely small stream, flowing swiftly over the most beautiful boulders. I said I will visit you soon. Well yesterday was soon enough. I found myself along this stream with my 2wt, and a Bomber ready to see if the residents were active. After much time I had nothing to show for my efforts. 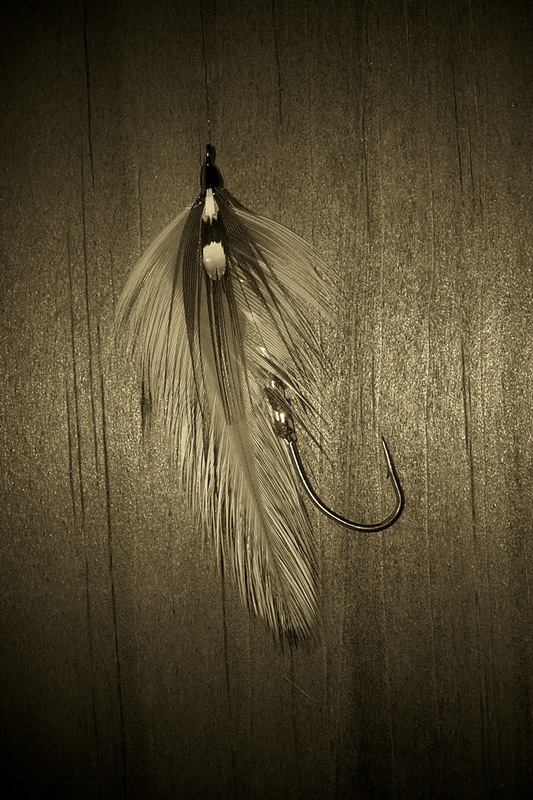 The trout pounced the Bomber, but I could not hookup, it was as if they were playing, and not eating. Looking in the fly box, not much variety, a lot of the same, just different sizes. A pink colored worm pattern caught my eye. It's a pattern that "Midge Man" from "Poudre Canyon Chronicles" ties, although his are more realistic. I tied this pink worm on and within three feet of drift, slam, I don't know what it was, but it was a violent hit. I continued to fish this stream for several hours on that fine mid September day, with many fish hooked on that worm, and even a few to hand. A fine stream, deserving of another visit. Two variations of the worm, tied on different hooks. I find this interesting, one beautiful wild flower, all alone. As if it to enjoys solitude. Wild brook trout.... Autumn colors, enticed by the worm. One of the things I enjoy doing is cooking. Usually it's just simple stuff that doesn't require a lot of work, or fancy, hard to get ingredients. I call it uncomplicated good cooking. I usually don't follow recipes, I just go along with how I feel and what I have on hand. Simple ground beef, with parsley, garlic, onion, and fresh mozzarella mixed inside. Sausage and peppers, any brand of Italian sausage, any type of peppers, or combination of peppers, onions, and tomato sauce. Mac and Cheese, or in this case spaghetti and cheese. Use whats available. The great part of this dish are the left overs. Slice a hunk of it and fry it in some butter or if you have bacon fat, that's better and enjoy it with eggs. This was one of those small streams that was on my list to fish. I had never fished it before, but my research said it held brook trout. Upon arriving at the stream, I found access to be quite easy, with some very handy parking. I said to myself...to easy, and that proved to be right. It was to be an enjoyable outing fishing new and what was to be productive. I had chosen to fish a favorite fly today, one that is special. 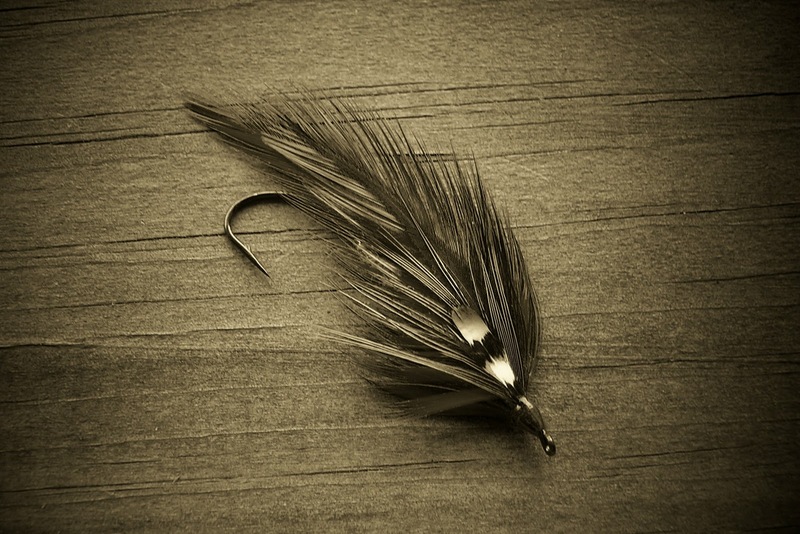 The fly has been a success for me most times I've fished it. The fly is a creation of Adirondack fly fishing legend Fran Betters. 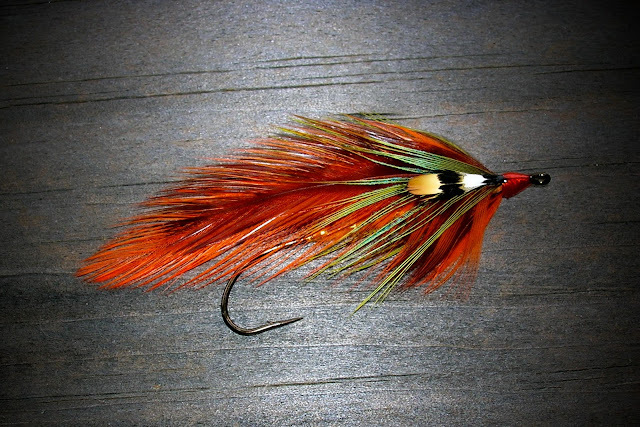 The fly is tied in a simple rough and rustic fashion, common to many of Frans flies. The fly is the "Aussable Wulff". If you want a fly that floats well, has great visibility, and catches fish, then this is the fly for you. On this day Frans fly worked its magic on the beautiful wild brook trout, that find their home in this free flowing freestone, small stream. While parking was easy, fishing required some rough walking to access the good water. While fishing, time is taken to enjoy the beauty along the stream. 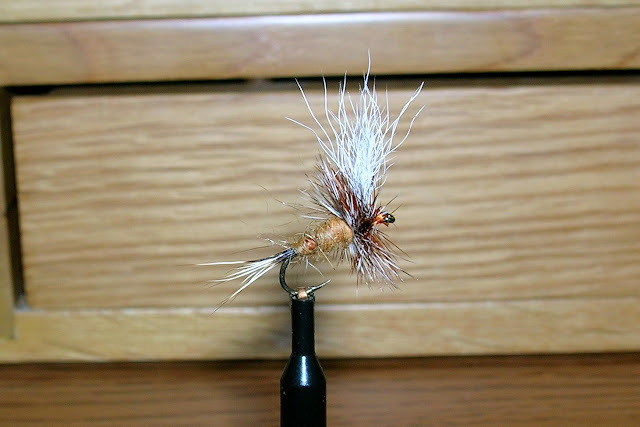 The "Ausable Wulff" as tied by "Fran Betters". This fly was purchased by me in Frans shop in Wilmington, N.Y. 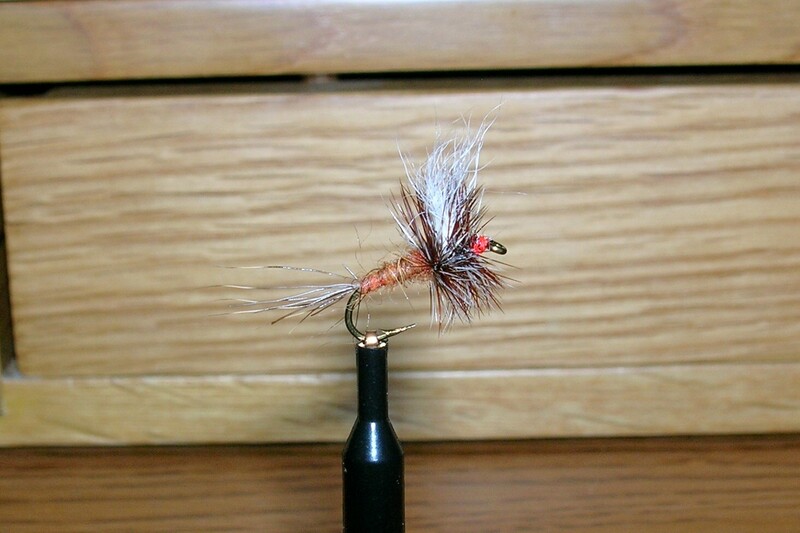 This my attempt at the Ausable Wulff. And when you come upon a stream like this, and you present an Ausable Wulff, just right. 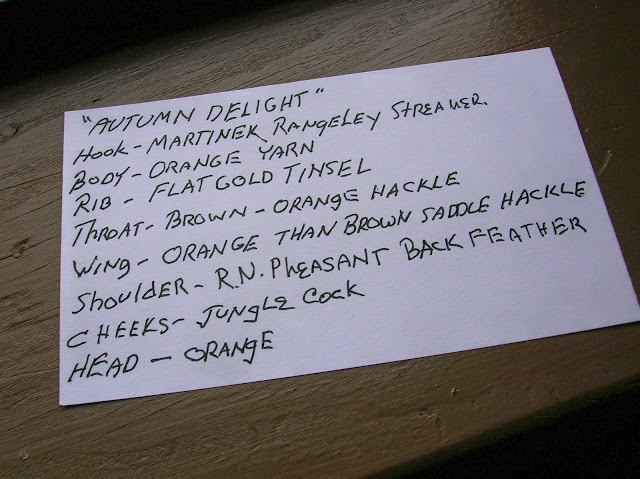 One of natures most beautiful wild jewels will give you the opportunity to hold him. 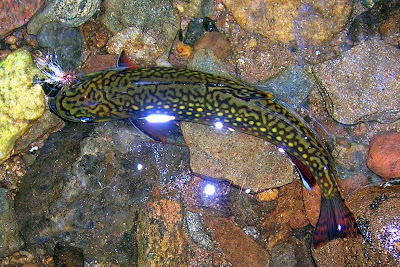 A male wild brook trout. This is a streamer I created. It's tied in the Rangeley style. 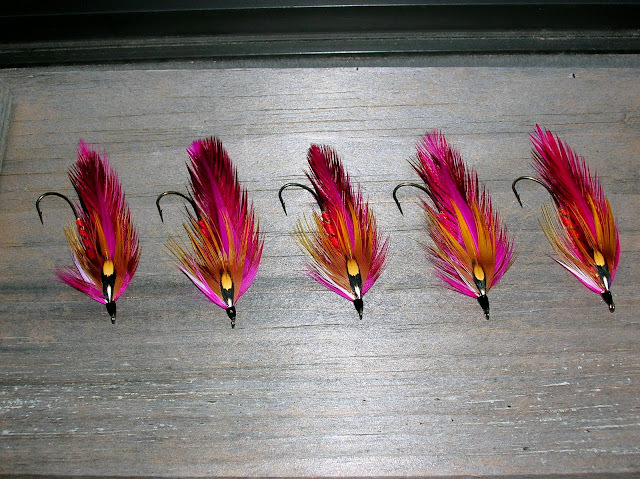 The feather colors used for the wing at first didn't seem to work, but when the streamer was completed those colors blended beautifully. 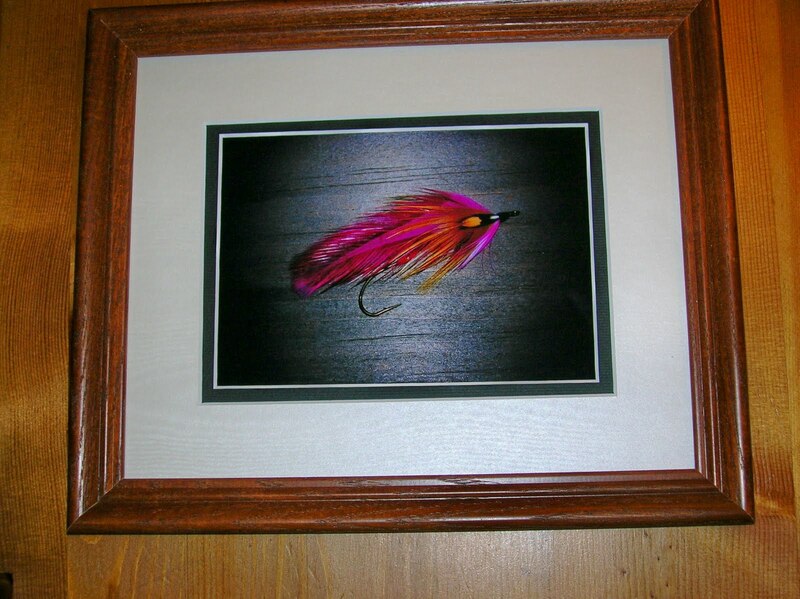 The name I have chosen for the streamer is "Wedding"
The photo print is available, a 5x7 double matted to 8x10. 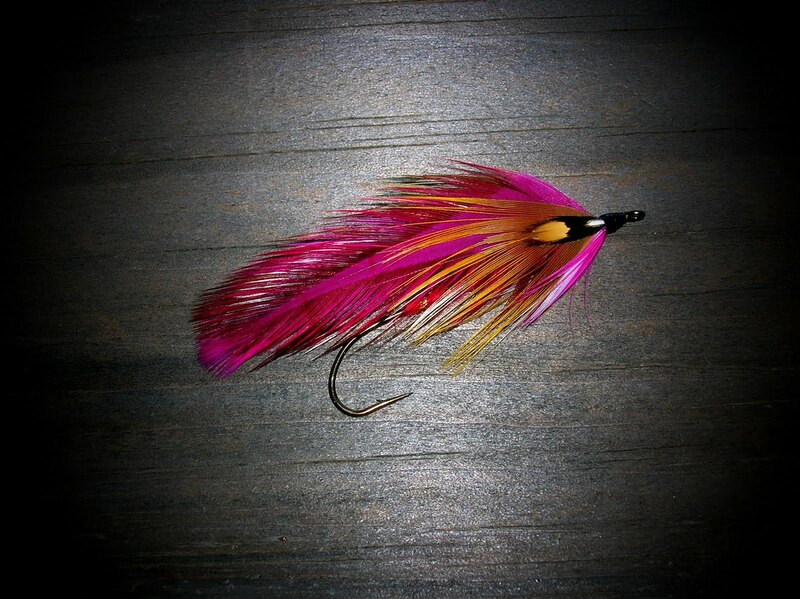 The streamer fly is also available.